". . .well written, extensively referenced, and provides a unified and very valuable overview of surface, interfacial, and adhesion phenomena in polymers for both graduate students and researchers of polymer and engineering science. " ". . .should be on the shelves of all polymer science libraries as it looks set to become a standard text. " 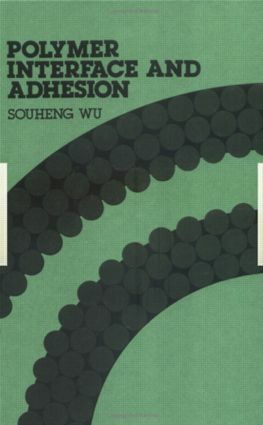 ". . .provide [s] an excellent foundation for every engineer concerned with the topics of adhesion and adhesives. " "Interfacial Thermodynamics Molecular Interpretations Interfacial and Surface Tensions of Polymer Melts and Liquids Contact Angles of Liquids on Solid Polymers Surface Tension and Polarity of Solid Polymers Wetting of High-Energy Surfaces Dynamic Contact Angles and Wetting Kinetics Experimental Methods for Contact Angles and Interfacial Tensions Modifications of Polymer Surfaces: Mechanisms of Wettability and Bondability Improvements Adhesion: Basic Concept and Locus of Failure Formation of Adhesive Bond Weak Boundary Layers Effect of Internal Stress and Bond Strength Fracture of Adhesive Bond Fundamentals of Fracture Mechanics Analysis and Testing of Adhesive Bonds Creep, Fatigue, and Environmental Effects Creep and Fatigue of Adhesive Joints Environmental Effects Appendix I: Calculation of Surface Tension and Its Non-polar and Polar Components from Contact Angles By the Harmonic-Mean and the Geometric-Mean Methods Appendix II: Unit Conversion Tables "